Hin Pae is one of Phi Phi's local dives famous because of the many blacktip reef sharks spotted by snorkellers. Hin Pae or Long Beach is only a ten minutes boat ride from Ton Sai, the main town on Ko Phi Phi Don. The reef consists out of huge brain coral, boulders and some loose coral patches in between scattered in white sand. 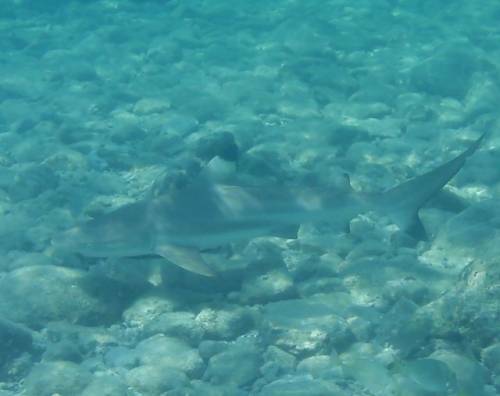 It is also named Baby Shark Point as it is a breeding ground for baby blacktip reef sharks. They are most often seen by snorkellers as they stay in the shallower areas. After your dive; just grab your snorkel and mask, get into the water and with luck you might find them. Other fish that resides here are coral reef fish such as groupers, clownfish, parrotfish, angelfish, bannerfish and butterfly fish. Some divers reach this site after a long swim from the southern most point of Long Beach.